Winamax is an online poker site regulated by ARJEL, France's online gaming regulator. 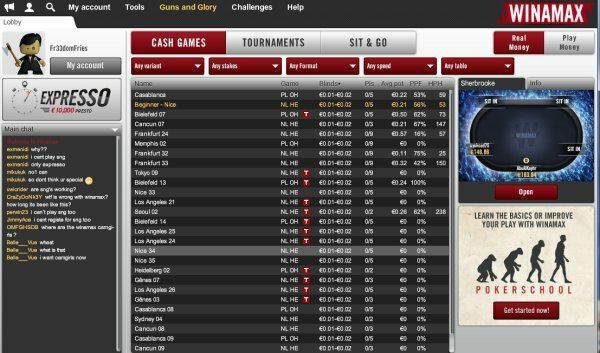 This site boasts some of the softest games around and has a wide variety of Hold'em and Omaha tournaments, sit and gos, and cash games. Winamax could be an excellent place to make your next deposit, as it also has an easy-to-achieve 100% first time deposit bonus of up to €500. Winamax is the most popular French poker site and one of the most popular rooms in the world. Anyone with a European bank account can enjoy playing on Winamax against really soft competition. Signing up for Winamax is a bit different than other sites. Since it is regulated by ARJEL, you'll need to verify your identity in multiple ways, including a code being sent to your mailing address. While some players might find this extra step tedious, it ensures a higher level of security, preventing multiple accounts and fraudulent players. The software is available on just about any platform you can think of, as it has clients for Windows, OS X, and Linux. 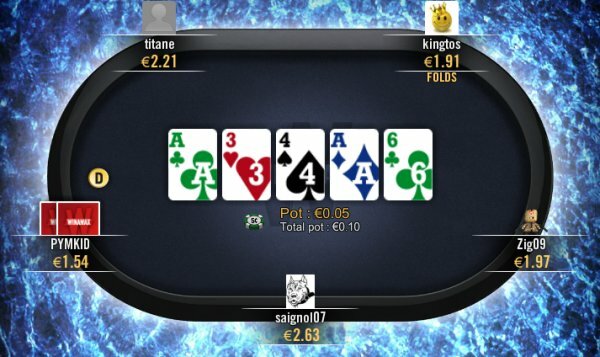 For those who want to play poker on the go, there are also clients for Android and iOS devices. If that is not enough, you can play on Winamax without downloading any software via an internet browser. The rake is higher than the industry average at 6.5%, with caps from €1.50 to €4 depending on the stakes. However, the lack of knowledgeable players on the felt more than makes up for this additional cost. Winamax is forced to charge a higher rake due to French gaming requirements. Winamax offers a large variety of sit and gos, including Expresso Sit and Gos. These are three-player hyper turbo sit and gos that are jackpot-oriented. These sit and gos are not only fun and quick, but also potentially very lucrative. It is possible to win anywhere from 2X to 1000X your buy-in just by beating two other players. Winamax has over €10 million in tournament guarantees each month and occasionally runs series to boost that number even further. On a weekly basis, Winamax runs a €50 re-entry Main Event with a €100,000 guarantee. This tournament has two starting days on Sunday and Monday, with everyone making it past the first day playing to the finish on Tuesday. This tournament might be the softest major on any site due to the lack of experienced players in it. Winamax’s VIP program is based off earning Miles. As you earn more Miles, you can improve your status, which will make you eligible for more freerolls and also help you earn Miles at a faster pace. Your miles can earn you cash, tournament tickets, poker gear, and many other items in the site's Boutique. For players first starting out, Winamax has a poker school that will provide the basics, including the odds behind Texas Hold'em. Winamax also has an achievement section where if you complete certain tasks, a new avatar is available for use. If you haven't already tried out Winamax and want to play against some of the softest competition around, download it today.